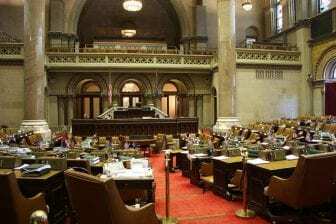 ALBANY, NY (WSKG) The New York State Legislature has announced it will hold hearings on Feb. 13 about sexual harassment in state government. The Sexual Harassment Working Group, made up of seven former legislative staff members who experienced or reported sexual harassment while working for the state, expressed relief, saying in a statement that they are “thrilled” with the decision. The group’s Erica Vladimer said the women have been asking for hearings for nearly a year. Vladimer came forward last winter, when she accused former Senate Independent Democratic Conference Leader Jeff Klein of forcibly kissing her at a gathering of lawmakers and staffers to celebrate the passage of the state budget at an Albany bar in April 2015. Vladimer said she’s tried to gain something positive out of the experience. “I didn’t do it for the sole purpose of just telling my story, but I knew how important it was to put it out there in order to advance stronger laws,” said Vladimer. Klein, as the leader of a legislative conference, participated in closed-door meetings in 2018 with two other legislative leaders and the governor to craft new anti-sexual harassment rules for the state. The all-male meeting excluded Stewart-Cousins, who was then the minority leader. Stewart-Cousins has set the date for the hearings, along with Assembly Speaker Carl Heastie. Gov. Andrew Cuomo has said repeatedly that anti-sexual harassment guidelines put in place last October are the best in the nation, but the Sexual Harassment Working Group disagrees. Vladimer said there’s more work to be done.